This elegant Townhouse has the MOST desirable location in Windsor Hills with its west facing position giving your family the sun all day long and the sight of beautiful Florida sunsets. It has much greater privacy than most homes with a beautiful view of a delightful sub-tropical landscape. This home not only offers a spacious, fully equipped kitchen perfect for cooking family dinners, but it also provides an adjoined bright and airy dining and main living space with a 50” LCD cable TV and seating for six guests. In addition to the fantastic main living area, all bedrooms are suited to help you relax and enjoy your holiday to the fullest. With friendly tropical décor, one master bedroom is fitted with a comfortable king mattress and the other with a queen, while the third bedroom with twin beds is a kids’ dream with a special Mickey Mouse theme – all ready to fall into at the end of your busy days. The best part of this townhouse has not even been mentioned yet! Sit outside and soak up the warm Florida sun in your own private backyard area with no rear neighbors! non-overlooked for greater privacy, West facing deck, sparkling pool, lounger, and table and chairs, you may not want to do anything else besides putting your feet up here! We had a slight problem with the washer -- the team came over promptly and courteously fixed it. We also rented a gas grill that was delivered and picked up on time and the delivery person went out of their way to help us relocate the grill. The property was excellent. Windsor Hills is a nice, safe family resort and quiet. Lots of space in the rental and it was in excellent shape. Our rental faced west and was not overlooked by another unit -- it was perfect for us. We needed help fixing the washer and it was promptly taken care of by the staff. We used the gym every day and took afternoon walks around Windsor Hills which is beautifully maintained. We came to Orlando because I attended a conference at the Swan and Dolphin -- it was certainly nice to come "home" after a long day at the conference. 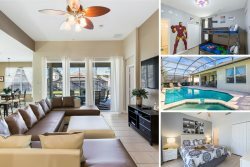 Windsor Hills is very conveniently located close to the Disney Attractions. We would certainly rent this unit again and recommend it to others.